The University of Alabama at Birmingham (UAB) will host the 53rd Annual Spring Topology and Dynamical Systems Conference, March 14-16, 2019 in Birmingham, Alabama. 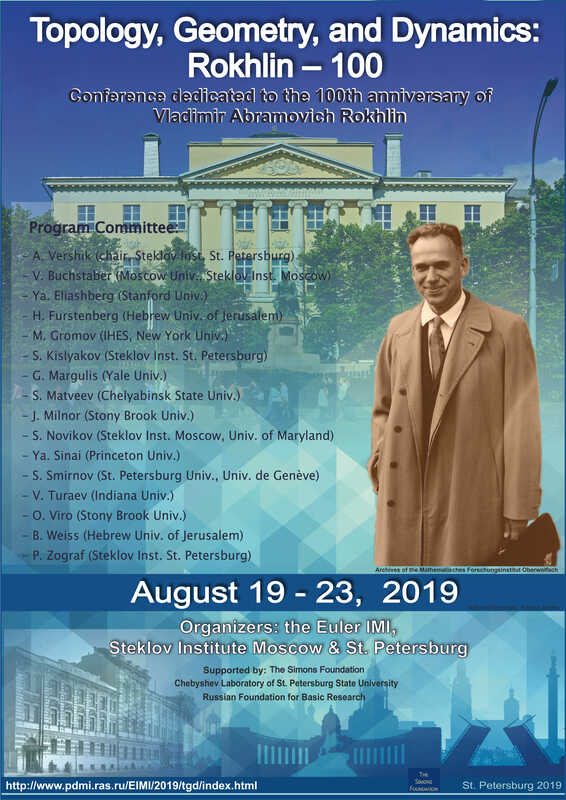 This year's edition will be special in that it will coincide with the final conference for the Marie Sklodowska Curie Project (IF) 'Combinatorics in transcendental dynamics’. For this reason, we would like to bring together (experienced and junior) researchers in holomorphic dynamics from several different perspectives. There will be four minicourses given by Misha Lyubich, Han Peters, Lasse Rempe-Gillen, and Pascale Roesch. Additionally there will be lectures and contributed short talks. Participants who wish to give a short talk are welcome to submit a title and abstract, and we will do our best to give everyone a chance to speak. The conference will focus on recent developments and breakthroughs in Dynamical Systems, Ergodic Theory and Geometric Measure Theory. In particular the conference will cover a very broad spectrum of topics including conformal and holomorphic dynamical systems, rational functions and transcendental iteration, thermodynamic formalism, fractal geometry, random dynamical systems, infinite ergodic theory, one dimensional dynamics and Diophantine approximation. The conference will also take the opportunity to honor the career of Mariusz Urbański <http://www.urbanskimath.com/> (on the occasion of his 60th birthday) who has made fundamental contributions to all of these topics.ed by Kostya Khanin, Elon Lindenstrauss, Jens Marklof, Yakov Pesin, Peter Sarnak. The meeting will include both research talks and short minicourses. Teichmuller theory and moduli spaces of Riemann surfaces have a special role in modern mathematics: they have been a fruitful playground for ideas and methods from complex and algebraic geometry, topology, analysis, and more recently dynamical systems. The main goal of this graduate school is to give the students the opportunity to learn about the various geometric structures on Riemann surfaces and their moduli, and related concepts in Teichmuller theory. Workshop application deadline: February 15, 2019. Organized by Ben Call, Ivan Chio, Osama Khalil, Roland Roeder, and Dan Thompson. The conference website is https://u.osu.edu/mwds2019/. The conference is supported by the NSF and the Ohio State University MRI. There are funds available for participant support, which will be allocated in keeping with NSF guideline – students, recent PhDs, underrepresented groups, and people with no other federal support get priority. Requests for support received by April 8th will receive a response by April 15th. Organized by Kostya Khanin, Elon Lindenstrauss, Jens Marklof, Yakov Pesin, Peter Sarnak. The conference website is http://ias.huji.ac.il/22midrshamathematicae. There is limited funding to support participants. The deadline for funding application is February 17, 2019. Complex-analytic methods have revolutionized the study of low-dimensional dynamics during the last several decades. A beautiful synthesis of techniques has emerged, creating a new field which has combined such seemingly disjoint topics such as the structure of the Mandelbrot set, the stochastic properties of a typical interval map, Feigenbaum-Coullet-Tresser universality and renormalization, among many others. Misha Lyubich’s work has been central to the development of this field, and his 60th birthday gives us an opportunity to take stock of the current state of the art, as well as to chart new directions. The aim of the conference is to bring together experts working in the area of complex and real low-dimensional dynamics, and closely related fields of conformal geometry, groups and foliations and general smooth dynamical systems. This wide range of topics is tied together by the general theme of the use of complex methods in dynamics. If you are attending, please fill out the RSVP form at your earliest convenience to help us with the planning. The Workshop will be held from 24 to 27 June 2019 at the University of Sydney. Milena Radnovic, Vera Roshchina, Luchezar Stoyanov, Viktoria Vedyushkina. The last decade has seen spectacular and continuing advances in an approach to ergodic theory and its applications using the techniques and tools of thermodynamic formalism. The aim of this workshop is to progress this theory by focusing on a number of outstanding problems and challenges. The workshop will also be an opportunity to celebrate the 60th birthday of Mark Pollicott. Registration is required. The deadline for registration is 2 June 2019 and the deadline for applications for support is 14 April 2019. The program of the Conference is divided into three parts: 1)Topology, 2) Dynamics, 3) Real Algebraic Geometry. This is the third conference in a series featuring talks by leading researchers in these three areas who are also capable of conveying their message to the audience coming from various regions of these fields. Beside the leading senior figures we also invite as speakers a smaller number of younger colleagues who have already shown their lion's claws.